What’s a holiday platter without a jam filled cookie? These are simple and can be made with oodles of variations. 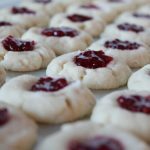 You can roll the dough in coconut, nuts, sugar, powdered sugar, colored sugar, and the middle can be filled with any type of jam. Love them topped with raspberry or apricot. I’ve also seen everything from cocoa powder to poppy seeds added to the dough. Brookie celebrated finishing finals week by staying in her jammies ’til five, baking three different types of cookies and watching Christmas movies with Jack. Jack loves a good holiday movie. Yum. Thanks Brookie. Jack, all dressed up and nowhere to go. Mix butter and sugar together until blended well, about 2 minutes on medium in mixing bowl. Mix in flour, just until all ingredients are incorporated. Do not over mix. Add a small amount of water( if needed) to form a soft dough that can be shaped. Shape the dough into a large disk in the mixing bowl. Cover with plastic wrap tightly and refrigerate for about 1-2 hours until thoroughly chilled. This step is important if you want the cookies to hold their shape when baking. Shape the dough into 1/2 inch balls. Dip one side of the dough into sugar. Place the balls two inches apart on a cookie sheet, with the sugar dipped side facing up. Slightly flatten the balls of dough. Indent each cookie with the end of your thumb, taking care to not flatten the cookie too much, but making the indent about 1/2 inch into the center of the cookie. 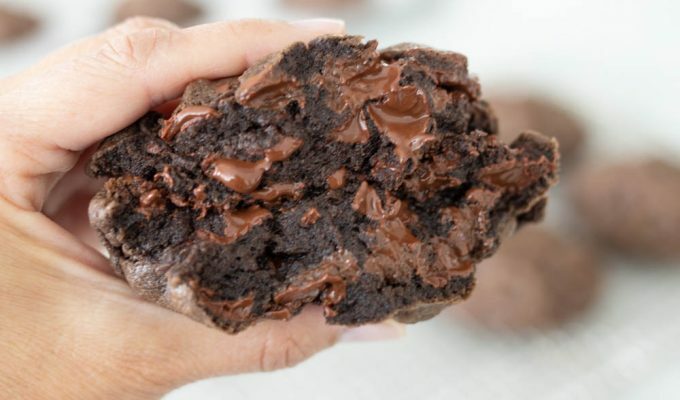 When you make the indent, use your other hand to hold the shape of the cookie and keep it in a small circle, pushing the outer edges of the cookie toward the center. Bake on middle rack for about 12 minutes, or until cookies are firm to the touch. Remove cookies from oven and let cool completely. Fill with any type of jam. ha ha that picture kills me. i love jack. Wonderful recipes very nice,gran receta muy bien elaborada felicoitaciones,abrazos hugs,hugs. I made these, and after at least 20 min in the oven, they are still squishy and white. I followed the recipe exactly, not sure why it didn't work! I have made these several times without fail. Did you add all of the flour? Did you check your oven temperature? After twenty minutes, they should be overcooked! Try turning the oven off and then on again. Let it totally pre heat. Then bake as directed. Hope this helps. Hi Hannah, you can use salted butter. I wouldn’t add as much salt to the recipe though. Thanks for asking and for reading ABK!